An official movie poster for what’s a fairly astounding film. Let’s just get one thing out of the way: I am a big Richard Linklater fan. I still think Dazed and Confused is Matthew McConnaghey’s best work. I came of age with Céline and Jess in what’s now called the “Before” trilogy. So I went into Boyhood with a predisposition to be pleased with it. Pleased doesn’t quite cover it, though. Without giving anything away, it’s fair to state the obvious—the movie covers the life of one family, in particular as one boy experiences it—over the course of twelve years. And just as the aforementioned trilogy captures single, seminal days and nights in the lives of Céline and Jess separated by years of living in between, this one captures a series of moments over a large swatch of time, year by year. Some of these are life-changing, some of them aren’t necessarily so. But they all become seminal because they are the small moments that make up a life. Not a life that’s being lived in some overtly extraordinary way—one that’s extraordinary simply because it’s a life. If you were a passerby observing the characters from Boyhood you would think their existences were totally ordinary. Sad sometimes, sure. But mostly pretty average. Peel back the surface and it’s anything but, though. 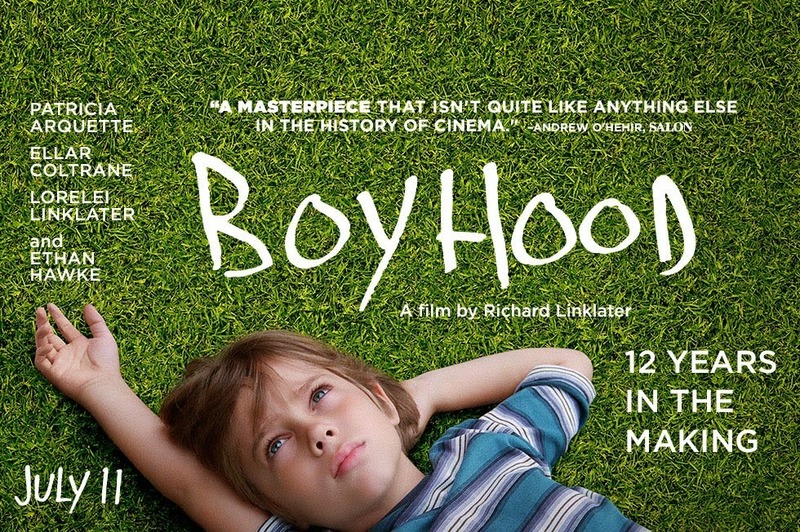 Filmed over the course of twelve actual years, Boyhood does the seemingly impossible (and in my opinion rare and beautiful): it gives the viewer the gift of sight into someone else’s world. That it’s a fictional world doesn’t matter in the least. Some of the best storytellers and some of their best stories—from George Elliot’s Middlemarch to Marilynne Robinson’s Gilead and many in between—do on the page what Richard Linklater tries to do on the screen. They peel back that surface and expose the epic struggles, the tragedies, the joys, the hard work, and the play that is day-to-day life of a single human being (or in the case of Middlemarch, of many). Because every life has these stories, and if you look deeply enough—closely enough—you can catch a glimpse of the wonder and struggle that exists just underneath the veneer that most of the world sees. It’s a gift to read such a story, and it’s a gift to see one on the screen. Boyhood is likely not for everyone. It’s nearly three hours long, and if you’re looking for something plot or action-driven, then you are very much barking up the wrong tree. It’s also utterly lacking in cynicism. But it’s intriguing and it’s ambitious and it’s beautiful—and for me, personally, it’s yet another reason to love Richard Linklater and wonder at his ability to show moviegoers an inside look at what George Elliot described as the many who “live faithfully their hidden lives.” And for that reason alone, I’m looking forward to seeing it again. Fox Mulder, pondering aliens. (Or, really, just an excuse to post a dreamy picture of a young David Duchovny on my blog). Did you know that approximately 4% of the U.S. population believes that the government (nay, possibly even the world) is being slowly taken over by Reptilians? I admit that I did not—and that my recent discovery was accompanied by one part dismay and one part (4%?) pure joy. I am no Fox Mulder—I have no urge to believe this or any other weird theory, conspiracy or otherwise. But I’ve always been fascinated by people who do believe it. Once, many years ago, a friend and I went to a talk by a UFO-ologist at the Orient Heights Branch Library in East Boston. The idea of this talk being given at this location was, frankly, too much to pass up. Plus, I’d recently discovered my own love fantasy and sci-fi. This was a win-win situation. The gentleman who spoke that day described himself as a skeptic and a debunker, but he was clearly more than that. To debunk the false reports of UFOs and aliens, you have to believe that real ones exist. And most of the people not only believed it, but a number of them had experiences with UFOs and aliens that they shared. It was like being at a support group for folks overcoming alien encounters of one variety or another—a safe space in which to talk about what they’d seen or what had happened to them. Today, of course, you don’t need to huddle in the basement of a tiny branch library in East Boston to find like-minded people—you have only to type the right words into Google and a community exists for you, right there on your computer screen. This is a strange and truly wonderful world. A world in which 4% of Americans believe in Reptilians. While I do not share this belief (or that of ghosts, fairies, demons, Nessie…the list goes on), I do love stories about them. I love the idea that something strange exists just beyond what we can see and experience, even if the reality of it falls short personally. I even greatly appreciate that for many people this isn’t just an idea but a belief that’s real and part of the fabric of life. For me, though, it’s expressed through story—through what I write and what I read and what I watch. So where does the line get drawn between the fantasy writer, the skeptical UFO-ologist, the person who doesn’t rule out the possibility that ghosts linger among us, and the person who fervently believes that Queen Elizabeth enters her room in Buckingham Palace each night and peels away her human skin? This is not a question I can even attempt to answer. But I do feel like people crave this connection to something beyond them (in whatever form that takes) and always will. The truth is out there—all kinds of truths, really—and thankfully fiction helps me discover it. A lot feels like it’s happened since I last posted here—perhaps because it has. Yet another inane national conversation about the general merits of reading YA has come and (thankfully mostly) gone. The school year ended for the rest of my small family. The Supreme Court has made some questionable decisions (don’t get me started). Three fingers on my left hand decided to up and stop doing useful things like feeling what I touch and bending. And with the help of medication and physical therapy, they’re very slowly starting to work again. Then there was my last ever residency, at the end of which I graduated—at long last—from Lesley’s MFA program. Really, that’s a lot in a few short weeks. Immediately after graduation, I felt an overwhelming sense of loss. I won’t be at the next residency in January, and neither will the many friends who graduated alongside me and who’ve returned to their homes in other, far-flung places. But once that time of grieving for what’s past was over, I mostly feel—with the exception of my fingers, which are still kind of numb—kind of…exhausted. Not in a bad way, though. More in a taking stock way. I’m reading through the story that made up my thesis (as well as most of my time at Lesley) and slowly rebuilding the opening chapters. Because I know things now that I didn’t before about the story, and the beginning just doesn’t work anymore. And it’s good to be in place where I can realize that—and begin to see the forest for the trees (and maybe vice versa, too). So, onward. To new revisions, new stories, new books to read, and new experiences. Maybe even a blog post or two every now and again. I’m crazy like that.